About 10 days after my first road trip, I needed another fix. I had another 4 days off in a row. 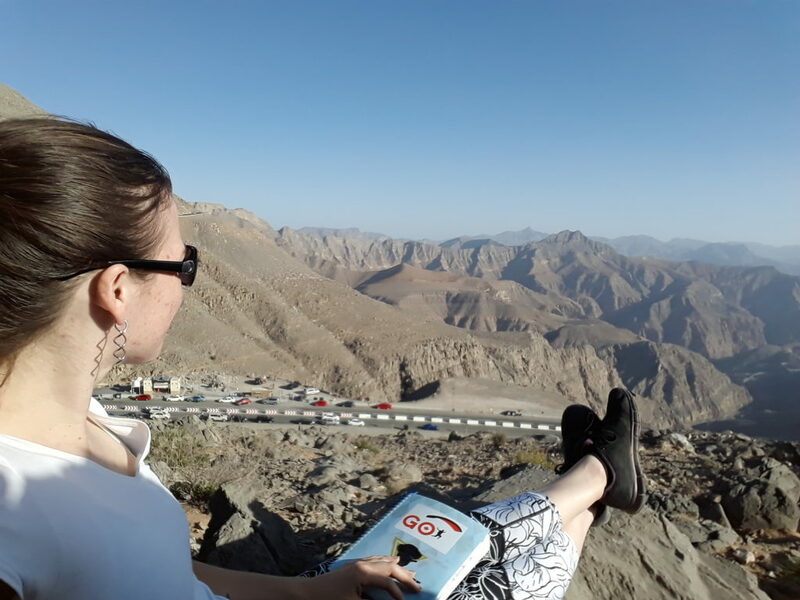 It was the perfect opportunity to keep exploring the UAE. I was no longer housesitting, so I rented a car and went on my way. The first day was spent jumping at the desert campus followed by dinner at a friend. 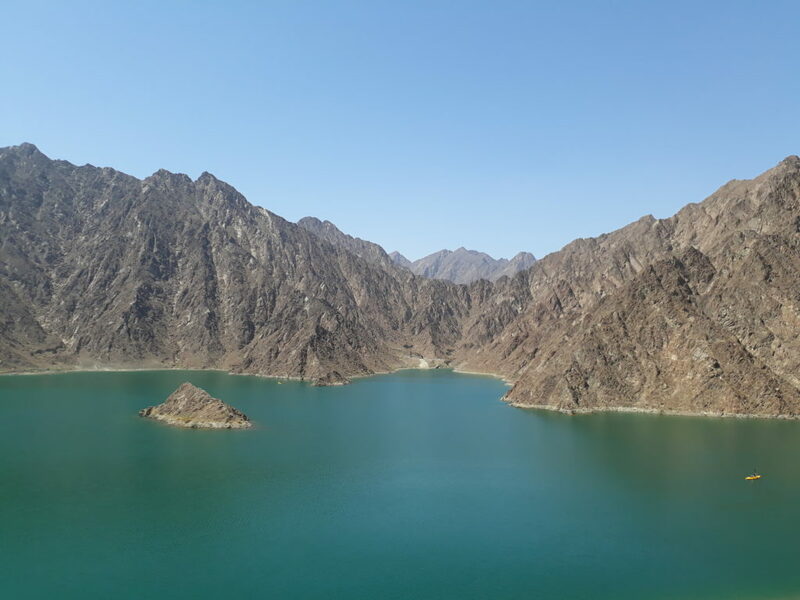 I wasn’t too sure if it was worth going to RAK right after, but I knew it would give me a full day there. If I would have gone back home to sleep, I would most likely have started my day much later. After dinner, I dropped a friend at one of the Metro station and headed towards Ras Al Khaimah. I didn’t see much of the road as it was night time, but it also allowed me to avoid the terrible traffic to Sharjah. 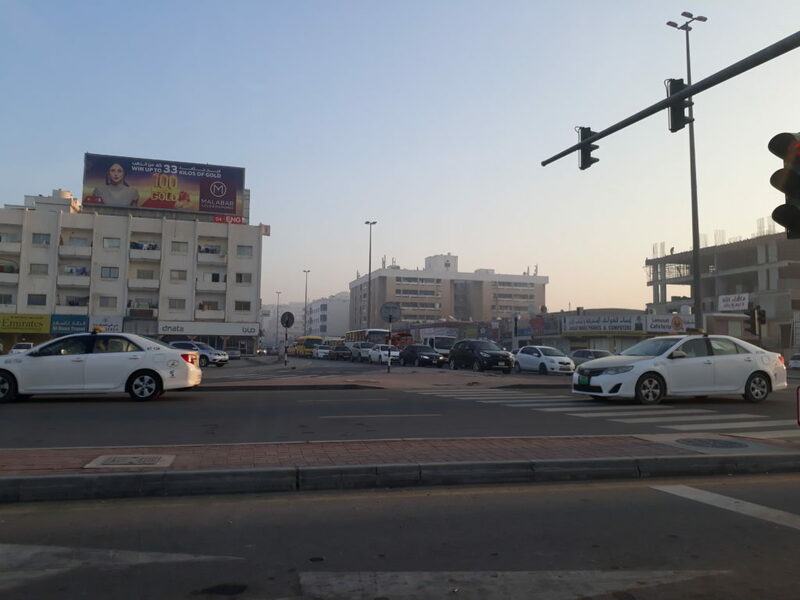 A few colleagues live in Sharjah and work in Dubai, and even though it’s only about 50km, it sometimes takes them about 2 hours to get from home to work, and 2 more hours from work back home. I honestly never understood why they would choose to put themselves through that every day. Thankfully, that evening, there was barely anybody on the road. So after slightly over one hour of driving I checked-in the Al-Nakheel hotel. On my way in, I could see people chilling and having fires on the sand dunes by the highway. I almost stopped and joined people as it looked like everyone was having a great time. But I didn’t. I wasn’t too sure it would be a good idea to stop and ask random people if I could join them! 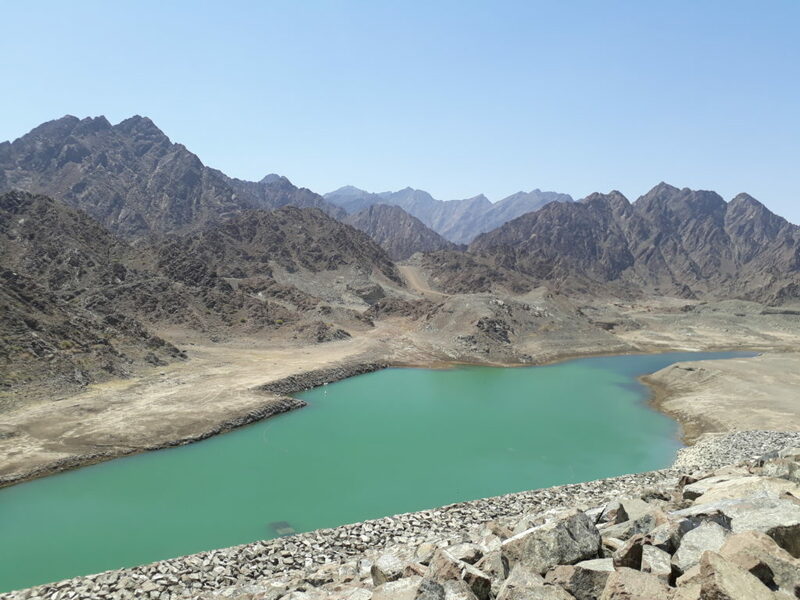 I had originally planned on going hiking for my first day in Ras Al Khaimah, but I was slow to get ready and since I had not picked a hike beforehand, by the time I was actually ready to leave it was way too late to start a long hike. So instead, I drove around the Emirate and stopped whenever I felt like it. 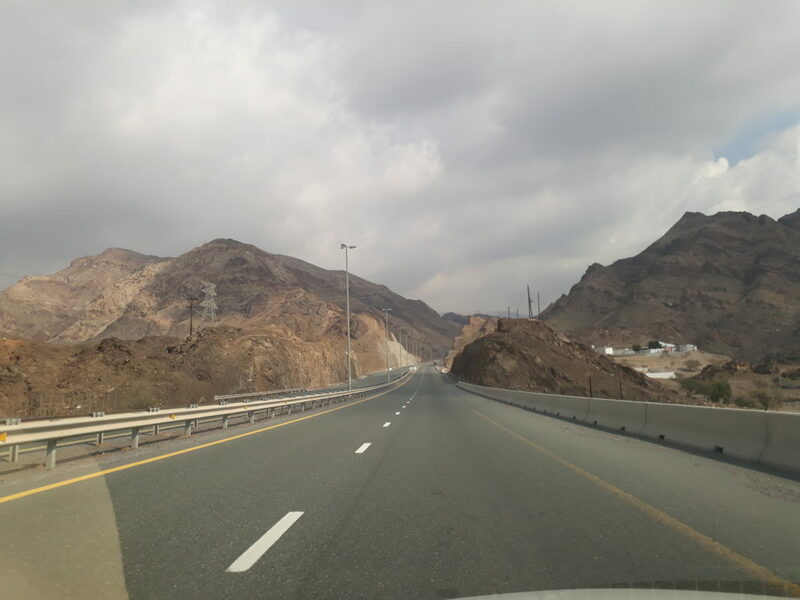 I first headed towards Al Jazirah, Al Hamra but for some reason couldn’t find the right road. I drove by the Hilton and the nearby coffee shop. 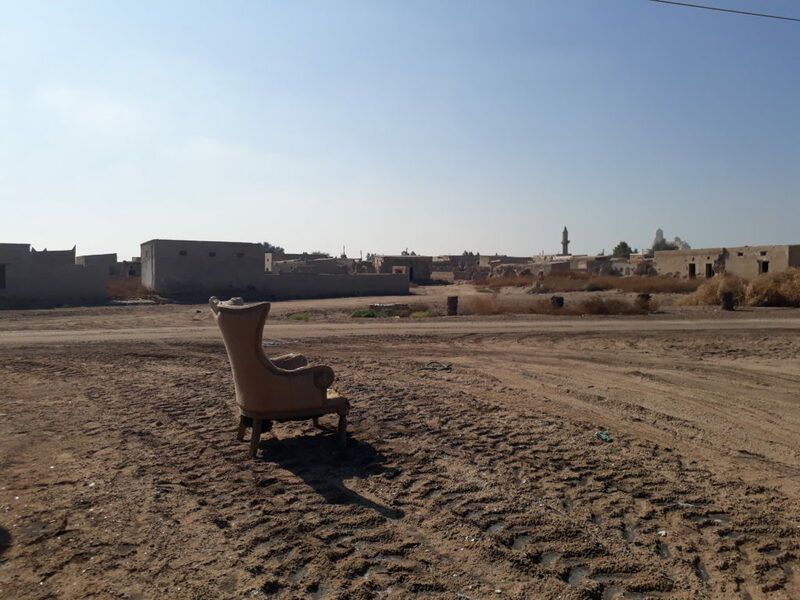 I obviously needed a bit of cafeine to help me out, so I picked up a coffee and then easily found my way and explored the abandoned houses of Al Jazirah, Al Hamra. 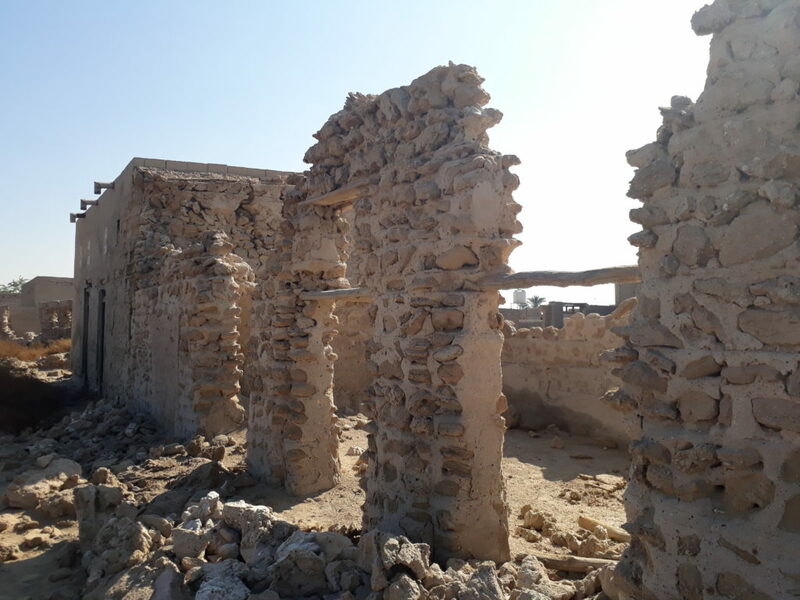 The houses were left abandoned when people left for the city. Technically people still owe them, but most of the houses are in different states of ruins. It is also widely believed to be haunted, and it was pretty quiet when I was there! I explored the different ruins for a while, picturing what it would have been like to live there. I’m not sure I would be brave enough to actually do all of this exploring at night though! Once I had enough of exploring empty houses (or at least empty from things I could see…) I went to Dhayat Fort. The fort is an 18th Century fortification. 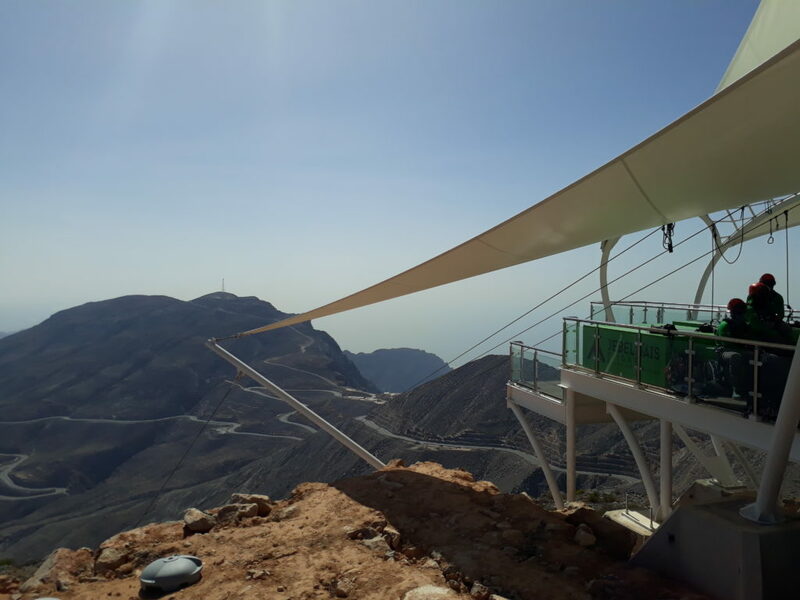 It boasts 360º views over the entire valley. A rather strategic choice. 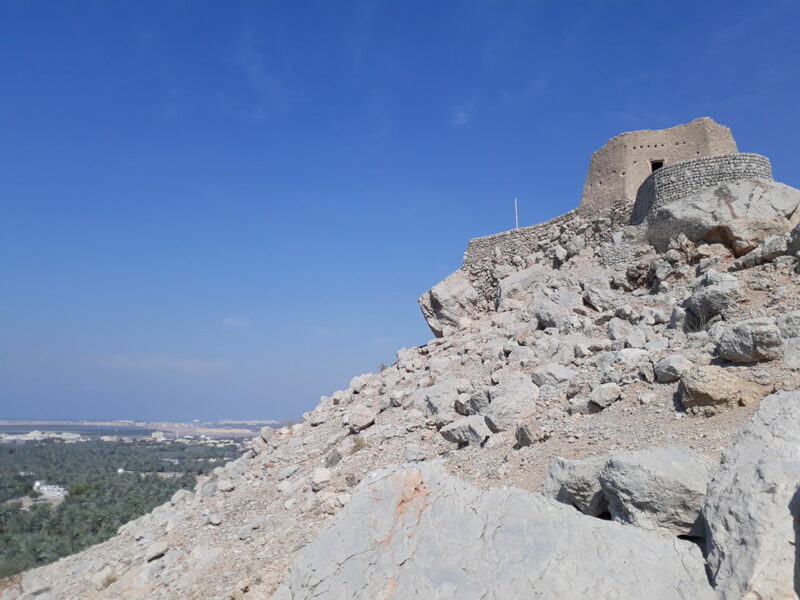 It is also said to be the highest hilltop fort (as opposed to tower or lookout post) in the UAE. I was lucky to have the entire fort to myself, so I explored, took the obligatory selfies and enjoyed the gorgeous scenery. Peaceful Sha’am. 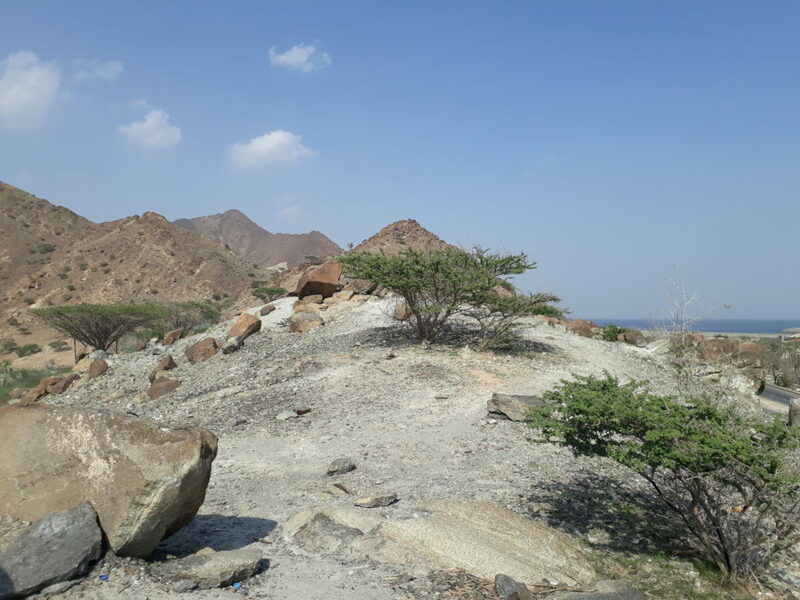 Can you spot the UAE flag painted on the rocks? 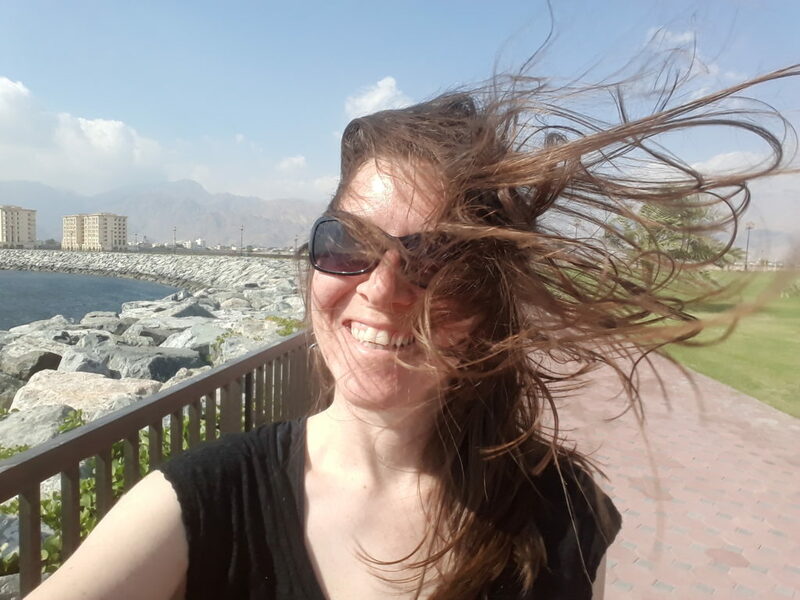 I got back in the car and drove to Sha’am, a coastal village in Northern Ras Al Khaimah. I dipped my toes really quickly in the super cold water and drove around the village. It was so quiet and peaceful. I stayed longer than I thought I would. 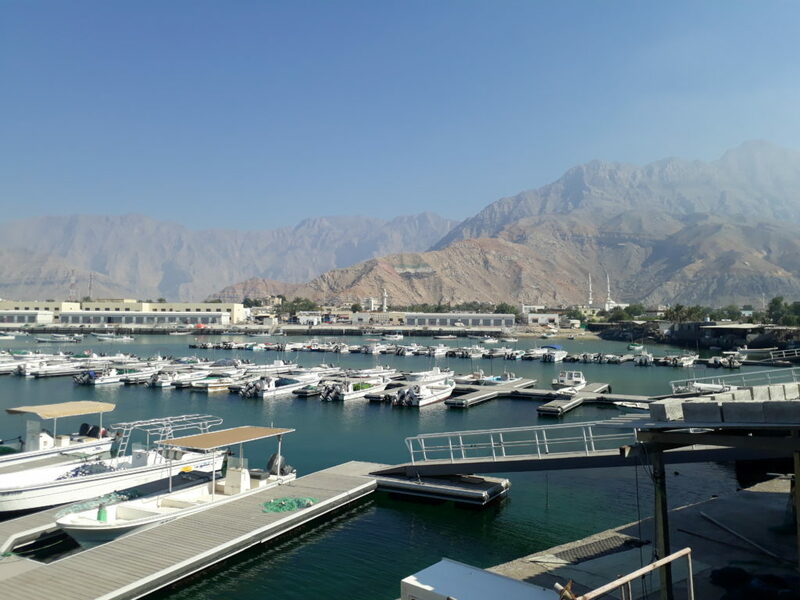 Sha’am is located close to the border with Oman and I was very tempted to go, but since I had a rental car that was not insured outside of the UAE, I decided against it. 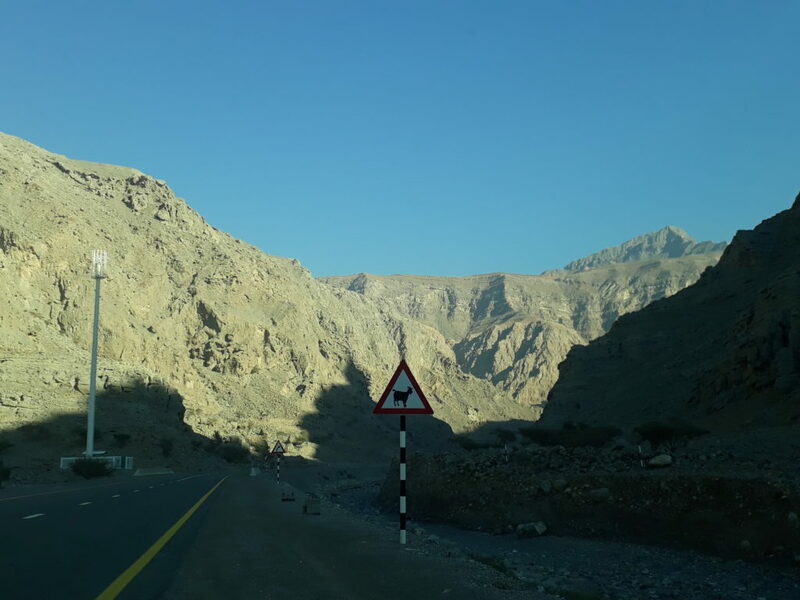 I turned around and since on my way I had seen a sign for Wadi Ghalilah and I had liked the name, I decided to drive it all the way to the end. When I got to the house at the very end of the road, I turned around and came back. The owner of the house looked rather puzzled as to who I was and what the hell I was doing there when there isn’t much to see! It did have a genuine feel though, like most small not-touristy villages I’ve visited everywhere in the world. The kind of place where time doesn’t have the same hold onto people. The life is simple and quiet. The road was very confusing because of some constructions and I followed the GPS to an actual highway exit, which I obviously took on the wrong direction. It was fairly flat between the exit and the road I was supposed to be on, so I quickly went offroad, got out of the exit and on my way. Pretending as if nothing had just happened! 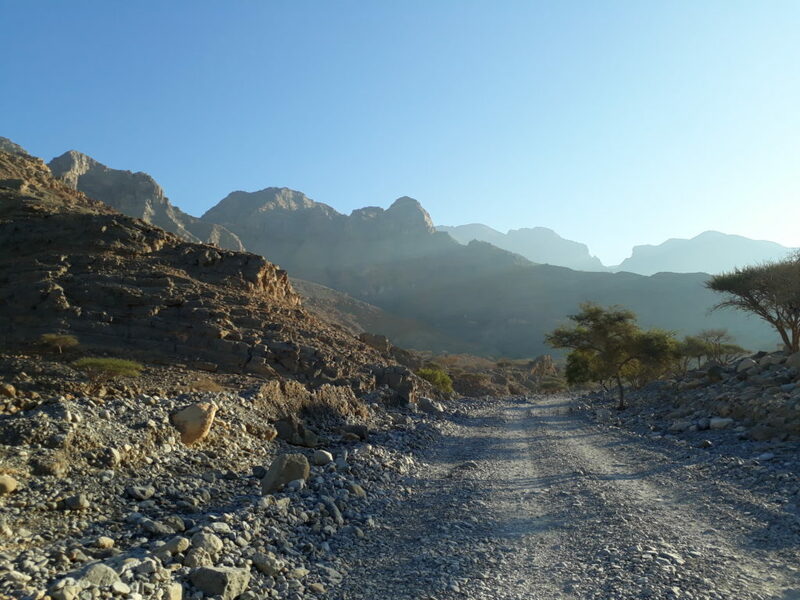 I kept going following my GPS but mostly the very few the signs to Jebel Jais (they have now added yellow signs pointing lost tourists in the right direction). 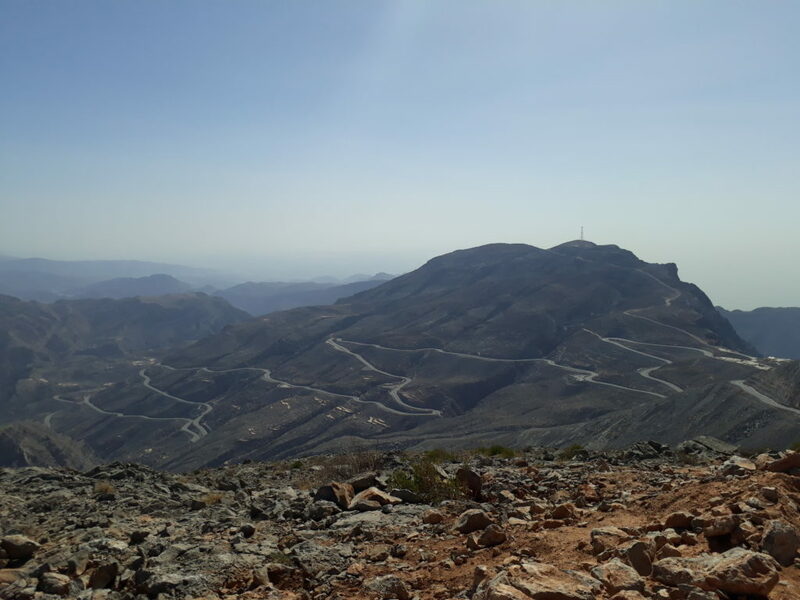 Jebel Jais, at an elevation of 1934 m is the highest point of the UAE. 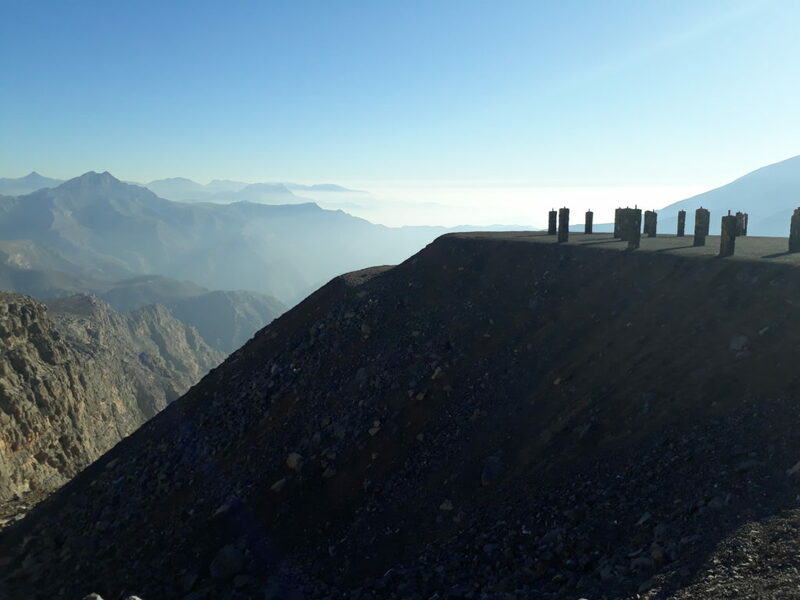 The rugged mountain and the road leading up to the top is beautiful. 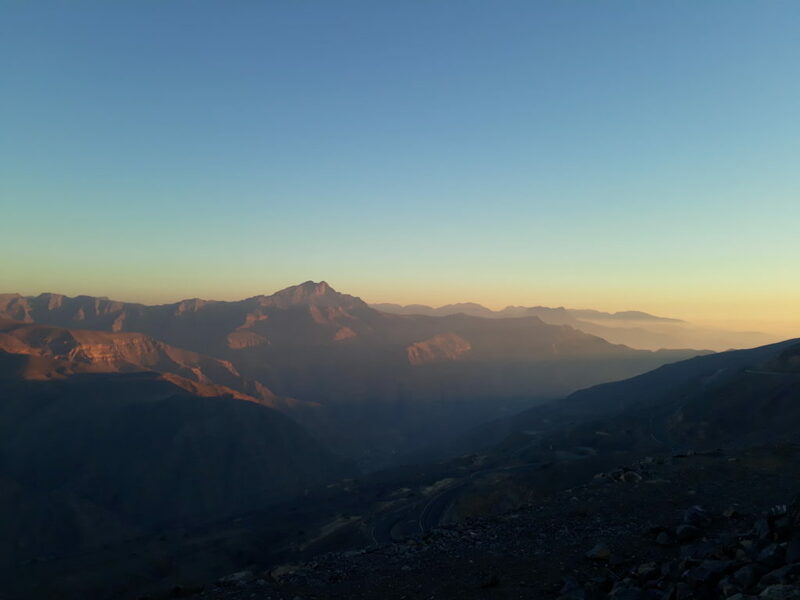 I planned my trip so that I would arrive there at the end of the afternoon, sit for a bit to enjoy the views and the sunset before coming back to Ras Al Khaimah. When I first went there, there was a main parking area, and a quieter area next to it (it’s changed a lot now, as it’s being developed for the Zipline). 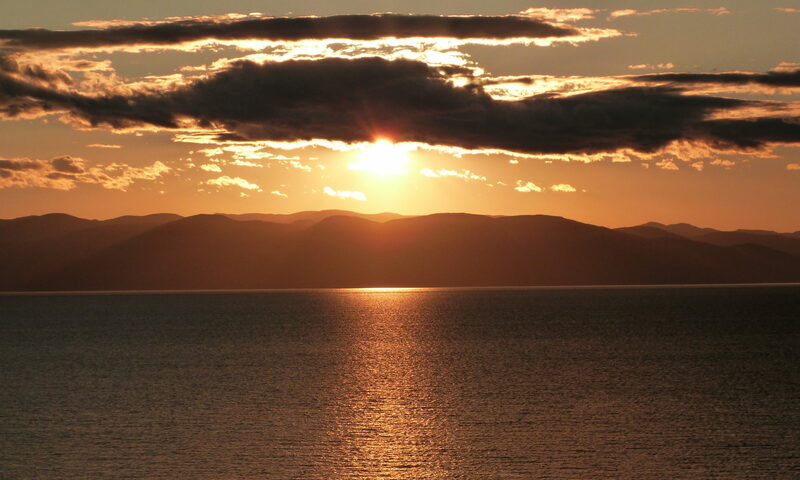 I sat there and took in the beauty of the place, and the calming feeling of being back in a mountainous area. People kept coming, mostly couples or families, to take photos. Most people were being rather loud, and didn’t seem to have the same feeling that I experience when I’m in nature. When it gorgeous around, I want to stay in silence, or whisper and take it all in. All that chatter and excitement was starting to get on my nerves, and instead of being calm, I was quickly getting annoyed. Eventually, I realized some people had climbed up the mountain on the other side of the road, so I decided to copy their smart move. I changed my shoes, climbed up and finally got to enjoy some peace and quiet. Since I realized I was far from being in a good enough shape to even consider a long hike (it had been a very long time since I’ve been on a proper hike) I decided on a short ”easy” one. I also liked the name although the story is not as cute as the name would suggest. Leopard Canyon was named that way as it’s where the last leopard was either seen or killed depending on the sources. I needed to fuel the car before I left the city, so I headed to a fueling station nearby according to my GPS. Of course, when I got there it was no longer a fueling station, but it was now turned into a parking lot. 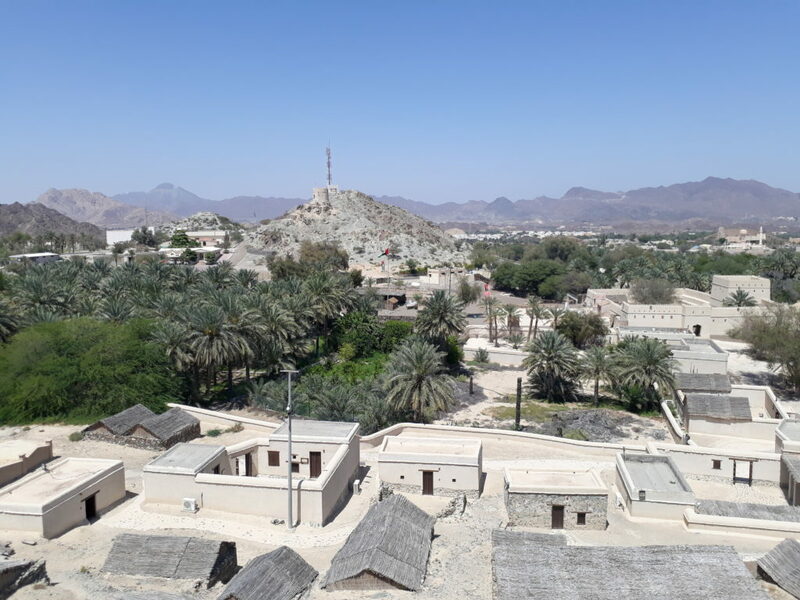 I finally found another station, and from Ras Al Khaimah, I followed the same road towards Jebel Jais, until the junction to a gravel road. I really didn’t have the ideal car to go off-roading so I went really slowly and it took forever to reach the beginning of the trail. I was almost at the village when the road got really bad. It was so bad that I wasn’t sure I would be able to make it with the car, so I parked on the side, and continued on foot. 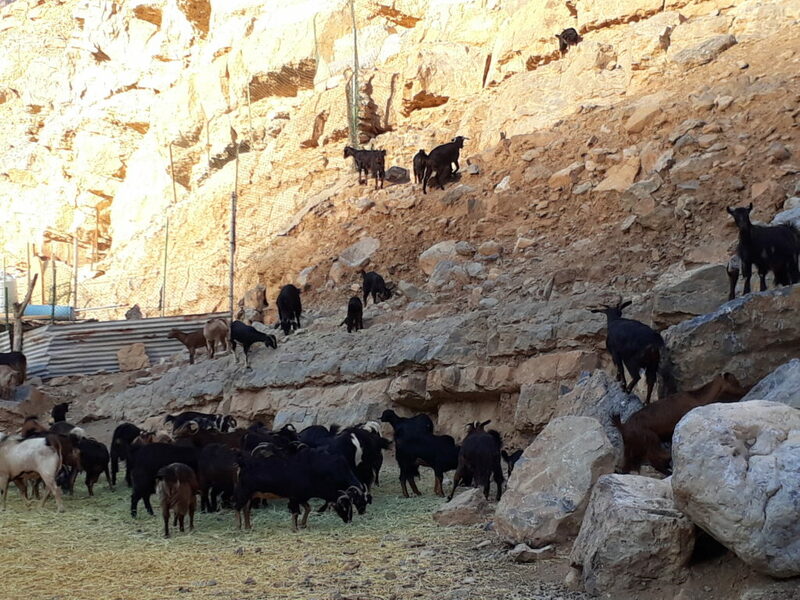 I walked past a farm and many goats which reminded me of Nepal. 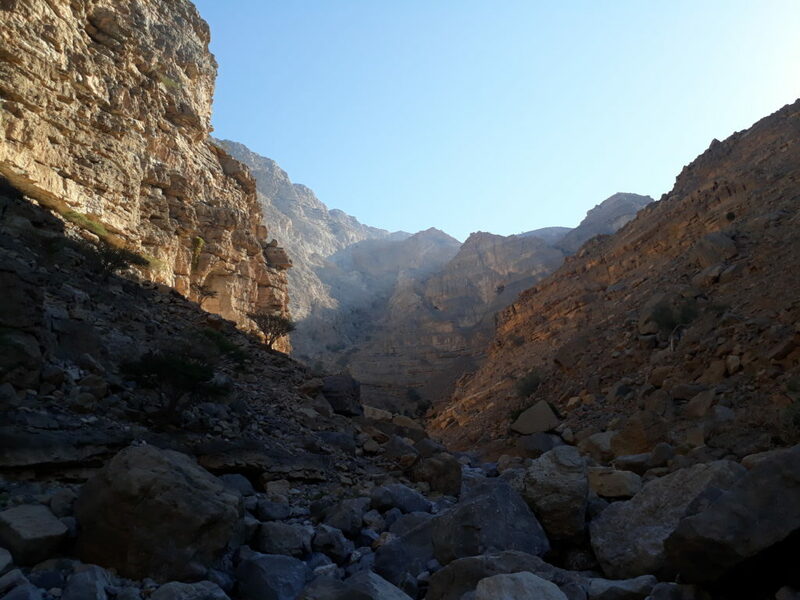 The Leopard Canyon hike is considered an easy walk, and while it is fairly easy, it can get quite difficult on the ankles since it’s mostly boulders and rocks. There’s also not many shaded areas once the sun is up. Luckily it was early enough that the sun had not passed the mountains yet so there was still a lot of shade for most of my hike. It was also winter season when I went, so the temperatures were bearable. A tree! I have to attempt a photo shoot, right? I walked past a beautiful tree and I felt like I had to stop for a photo shoot. It was a stunning location so I had to! Being alone though I couldn’t count on anyone else to take the photo. I resorted to using the timer, but it turns out running on rocks is not as easy as it looks! There was also a lot of flies who followed me for a while and kept disrupting the otherwise amazingly peaceful moment. When I reached the end of the canyon, I didn’t have quite enough of walking yet. 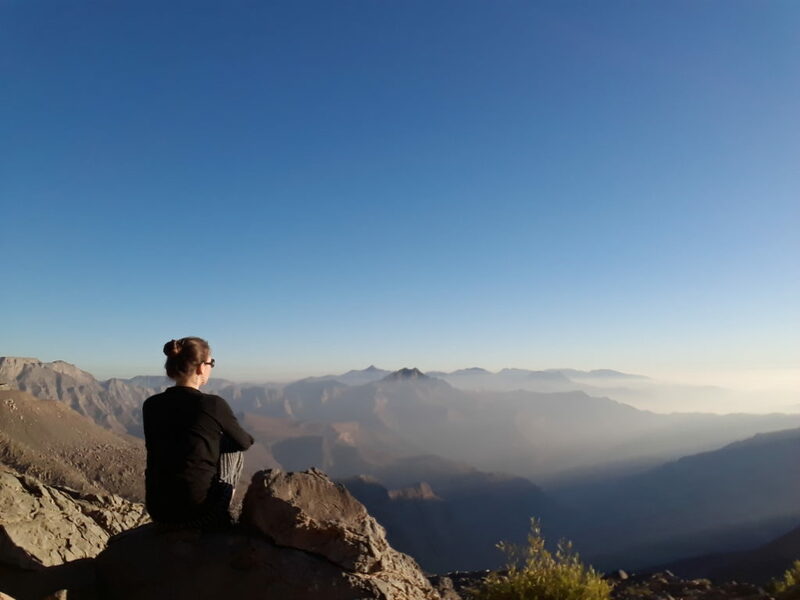 I wanted to go see the view from the top, so I kept climbing until I reached the top, making sure I would be able to come down. It was a lot of scrambling up and I didn’t want to twist an ankle or stay stuck when no one knew where I was and there was no cell service! At the top, I enjoyed the views for a bit. I wanted to keep going but I was unsure of the path to take and the sun was now out and it was getting very hot. 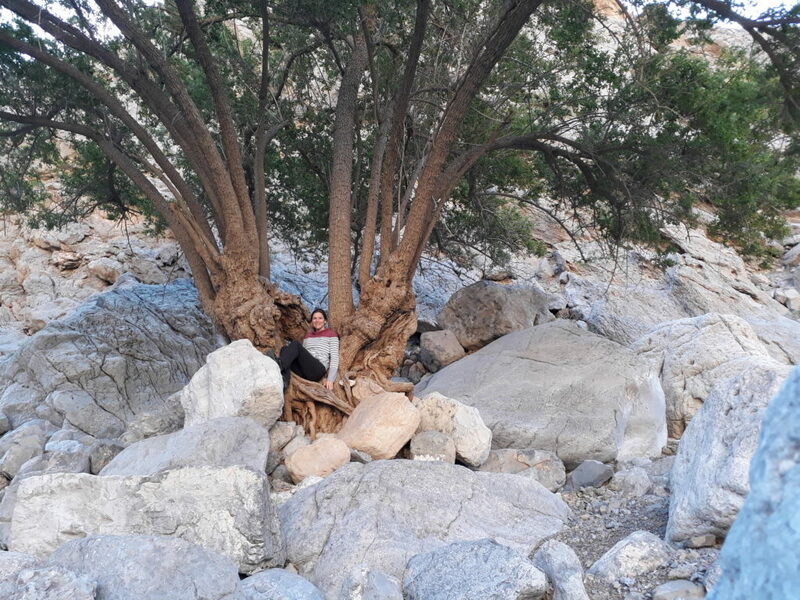 I didn’t want to get lost and I was already tired so I made my way down carefully, slipping down the rocks multiple time, getting a back workout at the same time trying to keep my balance. 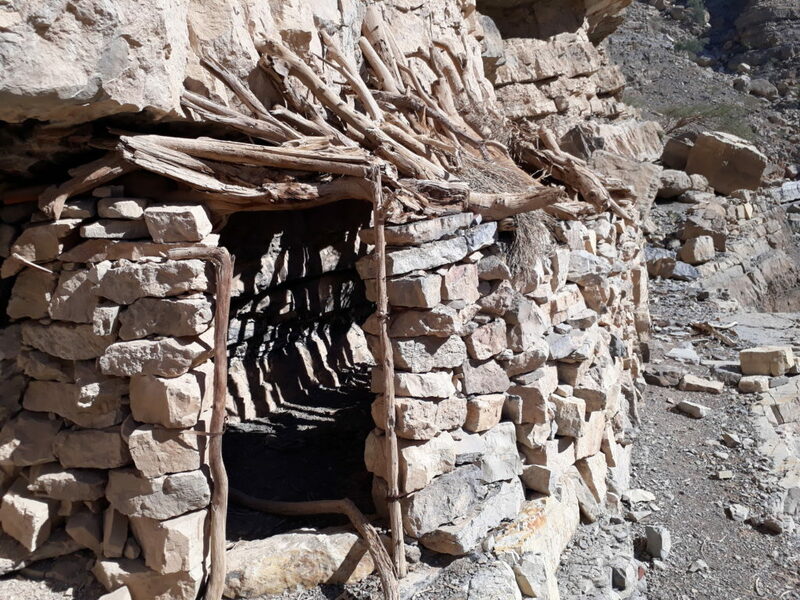 On my way out of the canyon, I noticed some shepherd’s houses and went to have a closer look before continuing my descent. It was a nice walk following my own rhythm but it got me super exhausted and I crashed into bed early that night. Driving out of the canyon, on the potholed road, made me realize that I clearly had not picked the right car for the job! The next day was my last day off. I wasn’t sure what I was in the mood for. 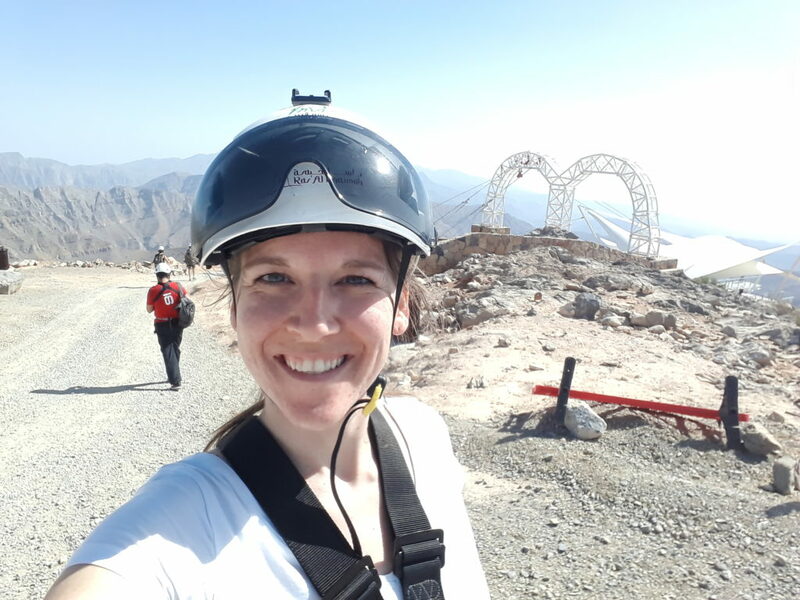 I had originally thought of going back to the Desert Campus to get more jumps in, but since it was rather windy and I was in an exploring mode, I got back in the car and decided to drive to the East Coast and the other border of Oman. The drive was simply beautiful and it was the best decision I could have made. On my way East to Diba, I stopped in a very small village which had the best view of the mountains. I parked the car and simply sat there for a while taking the views in. Once again some locals seemed to wonder what the hell I was doing there. But we nodded hello and they moved on with their day. Being the confused driver I can sometimes be, I took yet another a wrong turn. 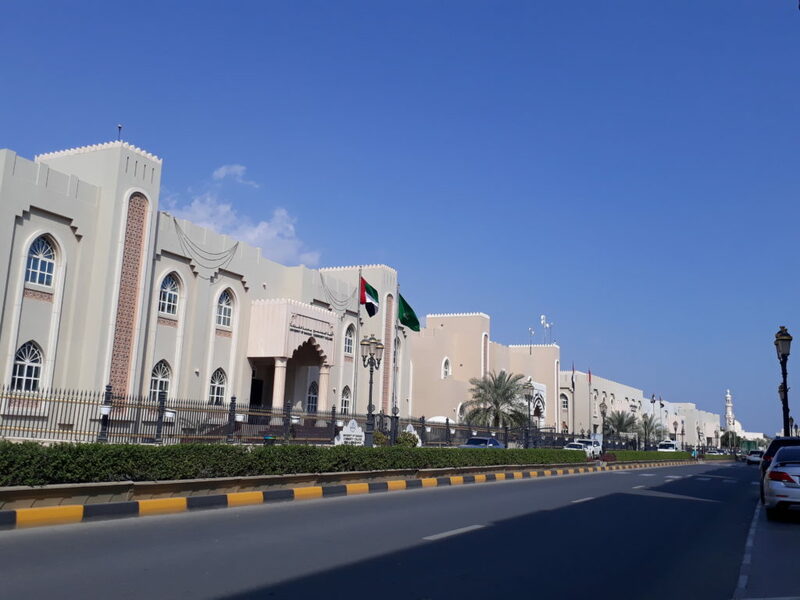 For some reasons, (I was most likely so lost in my music and my thoughts I wasn’t paying attention anymore) I took the wrong exit on the roundabout and picked the one that was leading to the actual Oman border control. I did an awkward u-turn in front of the gate and headed to the water, this time taking the right street, passing lovely municipal buildings. It was very windy that day and Diba’s promenade reminded me of Baie-Comeau, the city I grew up in. The water, the rocks, the wind, I truly felt at home. 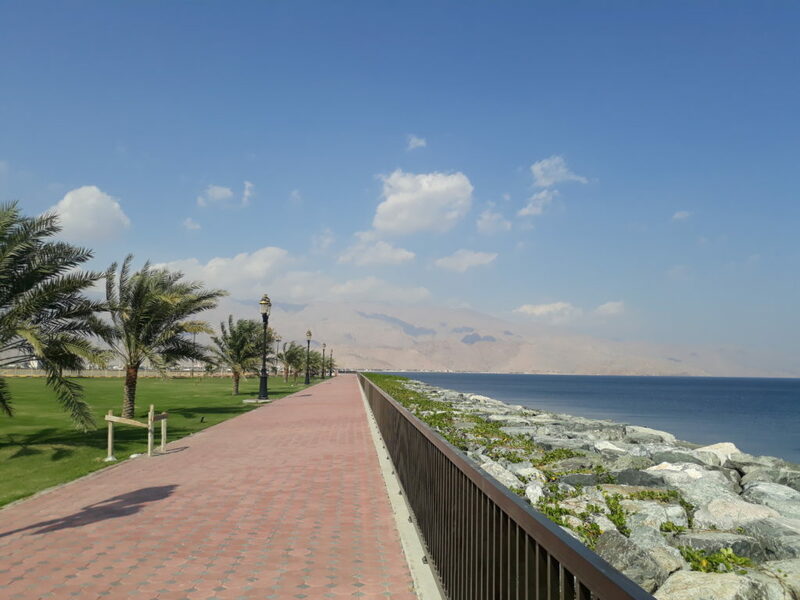 I walked along the promenade for a while, looking at the Omani mountains on the other side. Eventually, I got back in the car and had to circle the whole promenade again because I, once again, missed the exit. In my defense though, they were doing a lot of work, and had cones and deviations everywhere! Coral Bay, standing far from the cold water! Shortly after I saw a car coming back from what looked like a beach, so I went too. Coral Bay was lovely and empty. I took a few photos, dipped my toes in the water and almost dropped my phone. I didn’t expect the water to be freezing cold, which explained why nobody was on the beach! 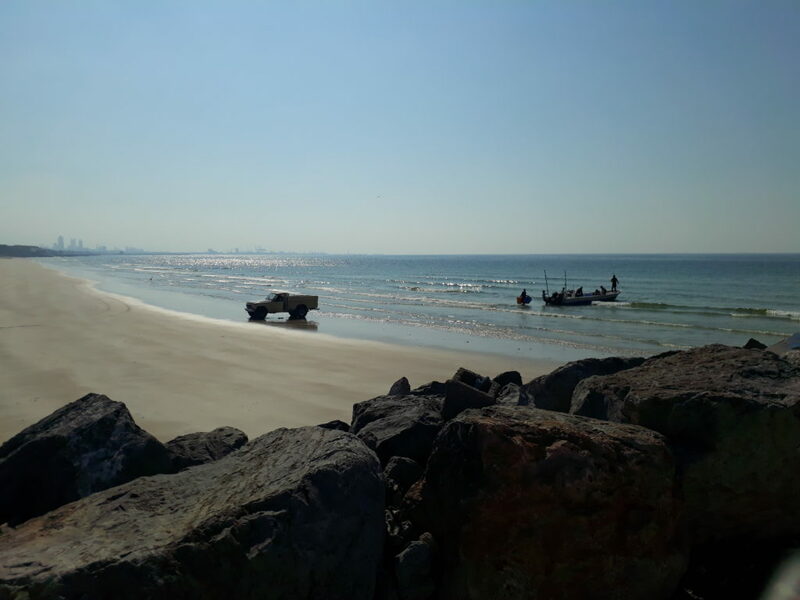 I kept driving and stopping everywhere that looked potentially interesting: Faqiat Beach near the Fairmont hotel as well as Al Bidiyah Fort and Mosque. 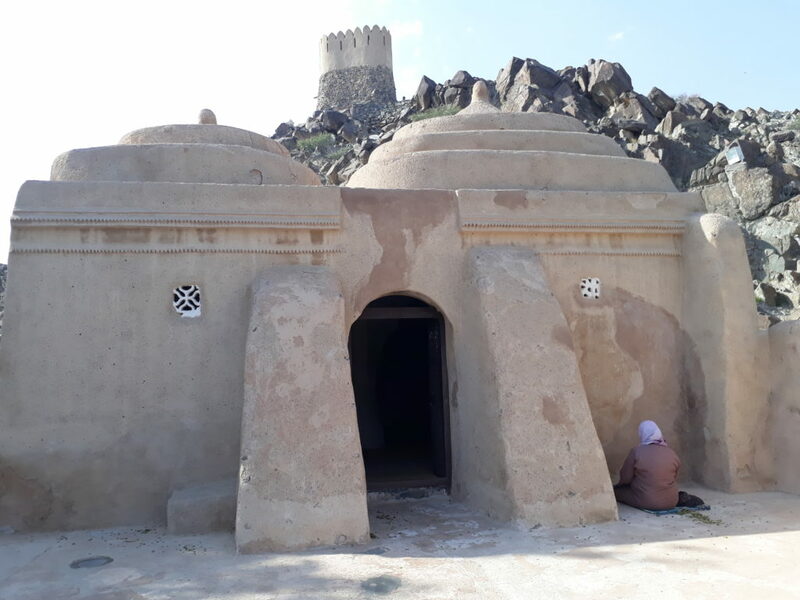 The Mosque dates from the 15th Century and is the oldest existing mosque in the UAE. After a quick look at the mosque, I walked up to the fort. I saw that I could walk up a little mountain next to the fort so I obviously had to go and explore. The view was perfect. There was a guy at the top and he asked if he could take my photo. At first, because of his thick accent, I thought he wanted me to take a picture of him at the top, but no, he simply wanted a photo of me there. Not even a photo with me… It’s always a bit weird to me but I thought why not. 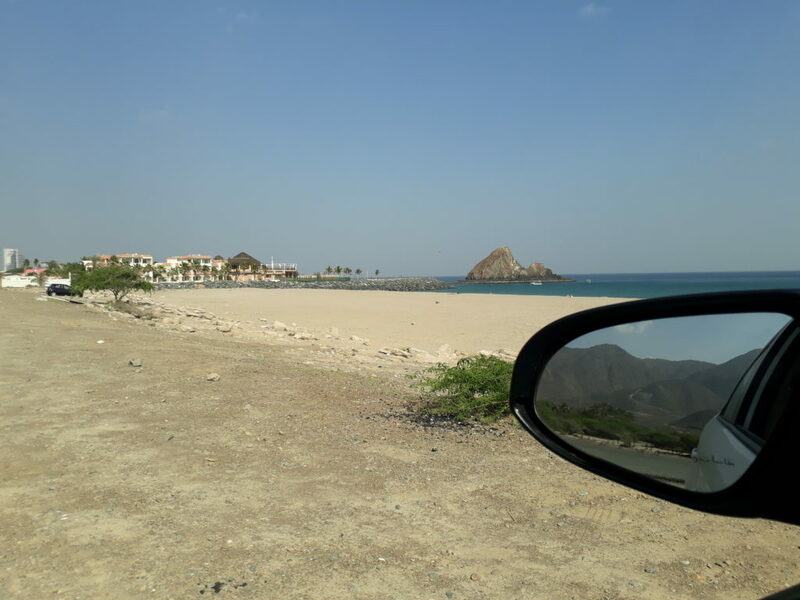 Later on, I stopped at Sandy Beach where my friend Camille had recommended I stop. It was a beautiful white sand beach exactly how she had described. 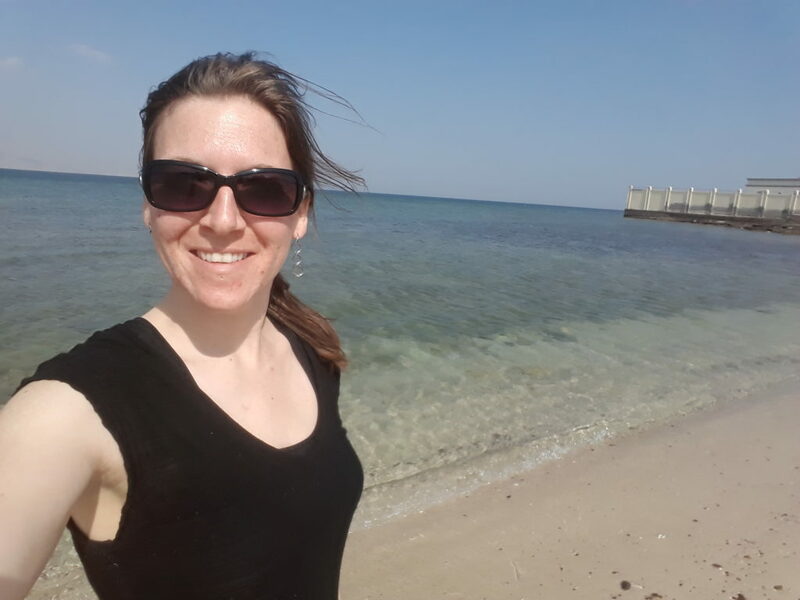 After sitting on the public beach for a while getting a lot of sand in my face because of the wind, and knowing I still had some driving to do, I decided to head back to Dubai. It was so nice to explore and discover. This is the main thing that makes me happy in life. And while everyone at work seemed surprised I would go on such a road trip alone, I enjoyed my own company and had a really good time. This mini holiday recharged my batteries. 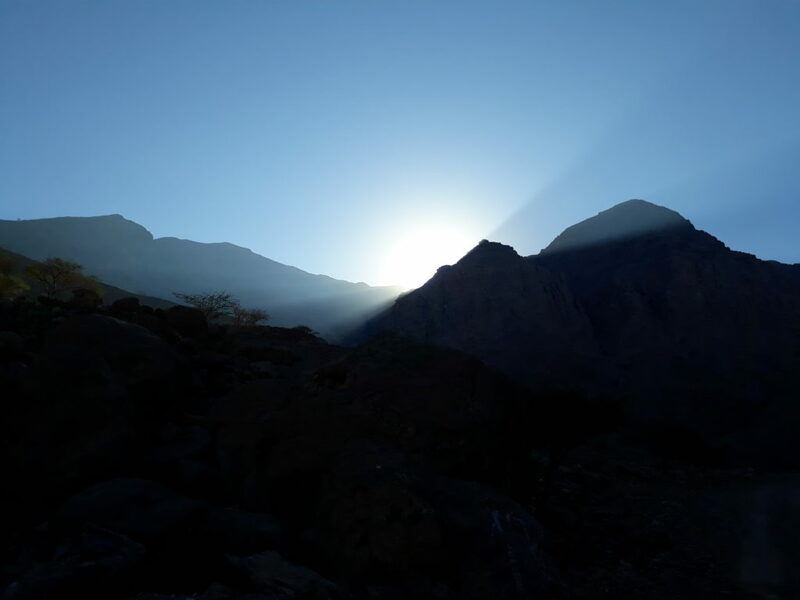 A full day of skydiving, dinner with friends, mountain roads with old forts and small marinas finished by a stunning sunset, a hike in a rocky wadi and relaxing. And another road trip with mountains and gorgeous views. It was the perfect getaway. I was rather proud of myself for going exploring pretty much without a GPS and allowing myself to get lost and stop everywhere I saw something interesting. Trusting my own navigational skills, even when it leads me to border crossings! Getting lost is not the end of the world and I can always turn back and return to where I came from. This realization made my road trips much more enjoyable. Of course in the cities or when trying to actually reach something I would use the GPS, but I’ve relearned to read the signs and notice stuff so I can find my own way instead of simply relying on technology. Part 3: Liwa: the biggest sand dunes of the UAE, and getting my rental car stuck in the sand. 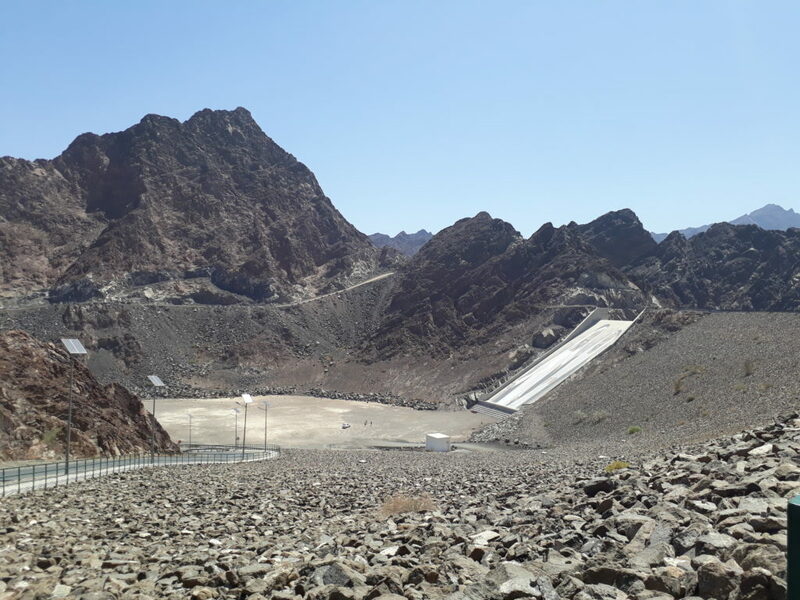 Part 4: Hatta and ziplining from Jebel Jais.